This year’s North American International Auto Show was a snoozer with Chevrolet having no big reveals, leaving the mid-engine Corvette for another day. However, crosstown rival Ford made news with the all-new 2020 Ford Explorer, as well as the debut of the 700-horsepower Mustang Shelby GT500. But that wasn’t all the Dearborn automaker had up its sleeve. At its press conference Monday, the automaker revealed two bookend variants — the 2020 Ford Explorer Hybrid and 400 horsepower 2020 Ford Explorer ST. This allows the Ford Explorer to cast a wider net on the market than the more pedestrian Chevrolet Traverse. 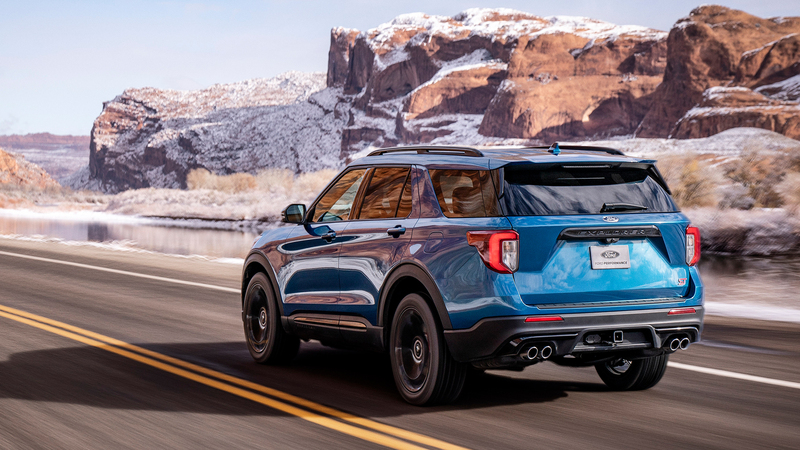 The Explorer ST is a 400-horsepower, 143-mile-per-hour family hauler that packs all-wheel drive and a twin-turbocharged 3.0-liter EcoBoost V6 under the hood. It’ll feature a sport-tuned 10-speed automatic gearbox, too. Yes, the Chevrolet Tahoe RST does pack a 420-hp 6.2-liter V8 engine, but its heft and size make it more of a tertiary rival to the Explorer ST. While the Explorer ST aims to get the heart beating of the SUV customer, the Explorer Hybrid is the more significant news item to come out of Detroit. Right now, Chevy doesn’t offer a hybrid SUV, leaving the Explorer Hybrid to stand alone when compared to other U.S. automakers. The Explorer Hybrid will use a naturally aspirated 3.3-liter V6 engine and a 10-speed automatic gearbox with a built-in electric motor. However, Ford did not release any details about the motor or the hybrid’s performance or fuel efficiency just yet. What Ford did say is that the Explorer Hybrid would get up to 500 miles of range on a single tank of gas—which is astounding for something so large. It’s always tricky to compare the latest vehicles from Ford and Chevy as they often don’t directly compete with another, though the Chevrolet Traverse and 2020 Ford Explorer are of very similar proportions, and will be of a similar price, as well. However, Ford has a good chance of enticing buyers from the bow tie with its two new Explorer offerings. Hopefully, Chevy has an answer. Looks good, no mention of the Durango SRT? Would seem a more vivid target for the ST, no? On a Day when GM states they are moving past hybrids Ford is introducing new ones! On June 23, 2009, Ford received a $5.9 billion loan from the Energy Department’s Advanced Technology Vehicles Manufacturing program. In return, it pledged to accelerate development of both hybrid and battery-powered vehicles. 10 years to put a battery and an electric assist motor in a car? What happend to that money? Again,,, what happened to the money that was to be used in Fords pledged to accelerate (((development of both hybrid and battery-powered vehicles))). Eighty-one percent of the funds went to create new efficiency technologies, (((81%, 4.779 billion, on turbos?))) for gas-powered vehicles. (((I didn’t realize a turbo was considered hybrid))) For example, they helped fund Ford’s aluminum bodies in the F-series pickups. Funny The 2004 Jaguar XJ8 had an aluminum body, 4 years before Ford dumped Jag off to Tata Motors and 11 years before the beercan f-series! They spent their bailout money on retooling their plants to build “Eco”boosts. Ford now has a serious product to go up against all of the rear drive based imports, as well as all of those brands making front drive based crossovers. Now, Ford can much better cover the upper mid level market with this new Explorer, and also attack the luxury market with the new Aviator. At the same time, better engine technologies with 10 speed transmissions now make for good fuel economy. We don’t know if GM will go after this smaller end of the full sized RWD SUV market? GM can still do more with their full sized SUVs, by adding a lowered sports roof version for each division. Production capacity is the key, but we do know that Arlington, Texas facility can always be expanded. Those German/Euro/Japan based players, may not like what Ford has accomplished with these new vehicles. Yet another in a long list of examples of GM leaving money on the table. Don’t worry folks, the Tahoe RST and Traverse RS are good enough. Seriously, what is wrong with GM? They have a 3.0TT V6 to go head to head against Ford but instead they trip over their own dicks. Product guy Reuss has got to go, he’s a legacy hire who has no competence beyond being the son of a former GM executive. GM completely goes out of its way to be mediocre, while Ford and others make every attempt to be class leading. What must it be like to live in an alternate reality where competition, the media and discerning customers don’t exist?? Many “discerning customers” make a point of avoiding those class leading Fords after the internal water pump turned the engine oil into milkshake or they were forced to pay for new timing chains and cam phasers out of pocket because Ford can’t be bothered to use a better timing chain. GM missed the mark big time with the Traverse RS. Price is bonkers high in the lineup and offers nothing more than an appearance trim package. This should have been the Durango SRT and now Explorer ST competition with more HP and aggressive styling. i guess the new Blazer wont compete ..??? That new Explorer grille is hideous. What’s with the bizarre way the sides of the grille meet the headlights. It looks terrible.